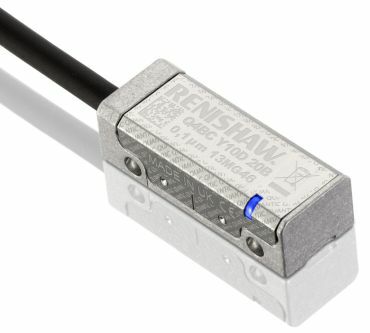 Renishaw has launched a new encoder family for linear axes, which offers exceptionally wide installation tolerances and axis speeds of up to 24 meters per second. 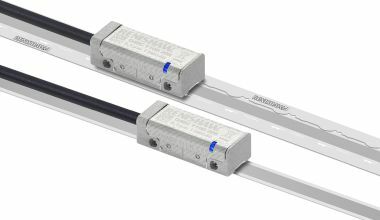 The QUANTiC™ encoder series produces a digital signal output directly from the readhead and eliminates the requirement for additional bulky external interfaces. This ground-breaking approach was first used for Renishaw's advanced VIONiC™ encoders. In OEM applications, machine build speed is critical. Swift component installation reduces lead times and increases profitability. QUANTiC encoders have been designed with this in mind and feature Renishaw's widest ever setup tolerances, exceptional dirt immunity and the optional Advanced Diagnostic Tool (ADT) for remote calibration and in-depth diagnostics. The QUANTiC encoder system uses a 40 µm-pitch scale, which translates to larger installation tolerances and higher operating speeds due to the unique optical design of Renishaw encoders. For instance, readhead installation rideheight and yaw tolerances are now ±0.2 mm and ±0.9° respectively. Available scale options include RTLC40 for carrier track (FASTRACK™) mounting and self-adhesive RTLC40-S: both simplify thermal error compensation by allowing independent scale expansion relative to the substrate. The QUANTiC encoder system is highly immune to dirt and contamination due to several advanced design features. QUANTiC readheads incorporate Renishaw's well-established filtering optics that averages the contributions from many scale periods and effectively filters out non-periodic features such as dirt. Measurement signals are further enhanced by a range of electronic signal processing algorithms such as Auto Gain Control (AGC), Auto Offset Control (AOC) and Auto Balance Control (ABC). QUANTiC encoders also feature a third layer of signal filtering from a new detector design which helps to eliminate non-harmonic signal frequencies that can occur due to contamination on the scale. These signal conditioning features combine to ensure low Sub-Divisional Error (SDE) and minimal signal variation over contamination. Unrivalled ease of set-up and calibration is supported by an Advanced Diagnostic Tool (ADT) which combines both ADTi-100 hardware and ADT View software components. Features and benefits include: remote monitoring; visual and audio indication of signal size, limit switches and readhead pitch; DRO output, Lissajous output and the ability to save data in multiple common file formats.